(Newser) – America's finest, indeed. 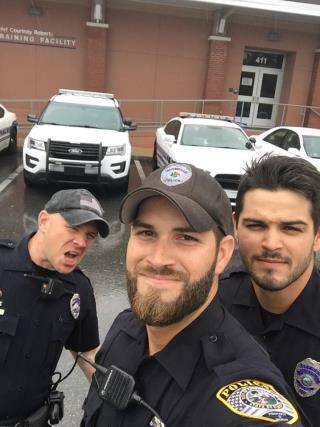 An Irma-related photo of three male members of the Gainesville Police Department has caused such a stir that the photo was updated to note "Officer Rengering is being placed into Cougar Prey Protective Care, similar to the witness protection program for his safety." And they aren't referring to the four-legged type of predator. The Sunday night post originally simply read, "Officers Nordman, Hamill and Rengering...part of the night crew getting ready to do some work. #Irma." But it's much more interesting reading now, thanks to the 127,000 comments that have been left, some of which "actually made our chief blush," per an update to the post that notes a charity calendar is planned. Gatorville Cops strike again! First the Basketball Cop Foundation wins the kids of the streets of Gainesville,FL and now the ladies get a turn. :-D Love a Gator Cop! At the end of the day they're still cops, rendering any bit of attractiveness non-existent. Plus, it is extremely tacky to be commenting on their physical appearance; if men were doing this to woman it would be deemed sexual harassment. Where is the feminist outrage over this blatant case of sexual harassment and objectifying men? ?